A friend of the Imam asks him, “Would you like to drink vodka or tequila?” Outraged at the indignity, the pious Imam slaps the man in the face. “What’s wrong with homemade aragh sagi?” he asks. This knee-slapper, which mocks Ayatollah Ruhollah Khomeini’s fierce rejection of alcohol and his promotion of domestic production (aragh sagi is a home-distilled liqueur), is among hundreds of “Imam” jokes making the rounds via text messages and social media in Iran. And while the anecdotes may seem harmless enough, Iranian conservatives say they are an insult to the founder of the Islamic republic. On September 3, Iranian police chief Esmail Ahmadi Moghadam warned that action would be taken against those insulting Khomeini. Ahmadi Moghadam flatly added that those who fail to respect “the limits of freedom” and violate the country’s laws will be dealt with. Ayatollah Khomeini is a revered figure in the Islamic republic, where he is commonly referred to simply as “the Imam.” Iranian state media generally portrays him as religious, knowledgeable, insightful, kind, merciful, and deeply caring about his countrymen. The recent slew of jokes largely mocks those traits. He is depicted drinking alcohol, making fun of others, cursing and using crude language, and as uncompassionate, merciless, and mean-spirited. Some of the jokes appear to reflect common criticisms of Khomeini, while others highlight unfulfilled promises he made to Iranians, including his pledge to provide them free water and electricity. Another is about a man who complains to the Imam that there is often no electricity and he has to eat his dinner in the dark. 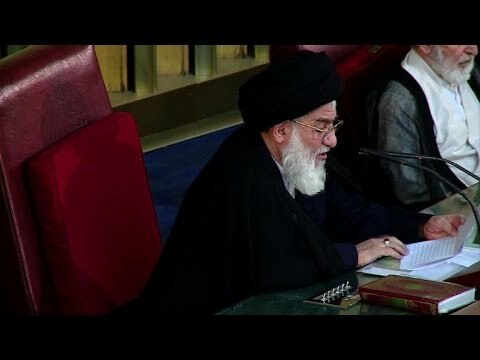 “Imam suggests he use an oil lamp,” goes the punch line, capped by the reminder that “bringing oil to people’s tables” was one of Khomeini’s main characteristics. London-based Iranian Internet researcher Nariman Gharib says the jokes first appeared on the instant messaging app Viber and later on Facebook. One Facebook page, titled “Imam’s Distinctive Characteristics,” has received more than 20,000 “likes.” The page administrators wrote that the page was created “only for a bit of fun and laughter” and that it didn’t belong to any political party. Iranians are no strangers to making jokes about their leaders, including Ayatollah Ahmad Jannati. The Guardians Council head has been targeted over his advanced age and his more-than-three-decade presence on the country’s political scene. But jokes about Khomeini were relatively rare, at least until recently. But the power of social media to inspire trends and memes have helped spread the Imam jokes like wildfire. “I think [conservatives] are angry because ayatollah Khomeini has lost his grandeur and making jokes about him has become very easy for people,” the researcher concludes. Earlier this week, prominent Tehran-based political scientist Sadegh Zibakalam suggested that the jokes were being spread by hard-liners in a backhanded effort to put pressure on the government of President Hassan Rohani. Rohani has promised Iranians more freedom, online and offline. But he’s met with resistance from hard-line opponents who criticize his policies, including in the cultural sphere. “[They want to say], ‘Why is the Culture Ministry not acting against these behaviors? Therefore Rohani’s government is to blame,” Zibakalam was quoted as saying on September 2. He suggested that hard-liners could also be using the jokes to oppose the introduction of high-speed Internet by the government and the potential halt of filtering of some social-networking sites. Zibakalam said hard-liners could argue that considering the fast spread of Imam jokes even with slow Internet and blocked social media sites, the situation would get much worse once speeds rose and filters were removed. The government recently granted licenses for 3G services to two major mobile operators, drawing criticism by hard-liners who claimed faster Internet would facilitate the sharing of un-Islamic content. Amid the spread of the jokes, an image of a “secret letter” emerged online bearing the logo of Iran’s powerful Islamic Revolutionary Guards Corps. It called on Communications Minister Mahmud Vaezi to filer social-networking sites by which the jokes are being spread. Vaezi on September 4 was quoted by state media as saying that the letter was fake.